Mrya, an extremely qualified and recognised nurse has spent over 40 Years working for the NHS in Berkshire, Somerset , receiving a 20 year Service Award for Gloucester. In 2010 she became a Qualified Creative Activity Therapist. You might know Myra, often walking her two dogs, actively involved in The All Saints Church and one of the lead organisers in the Open History Events, the most recent during the Last August Bank Holiday weekend, where a number of visitors expressed an interest in doing some historical searching. The Cox residence has been owned by the family since construction in 1938, although the views of the original farm long since gone, you can, whilst sat drinking a cup of co-op99 tea, imagine what used to be where Orchard Close now stands. Myra’s parents Leopold and Queenie-Mons Cox and for those that remember ‘D J Cox’ – a vibrant business that used the old coal yard to operate (think how Orchard Close would look like with mounds of coal) near the entrance of the grazing field that in 1973 became Mead Close. The Coal Yard, run by Mr Fred Hag whose family lived next door to the Home of the Cox Family. Fred’s wife was the District Nurse before the NHS in 1948. Another resident Midwife, Mrs Florence Cooke whose records show lots of ‘Newborns coming to town’ as the old saying would suggest. Not forgetting ‘Granny Marsh….. 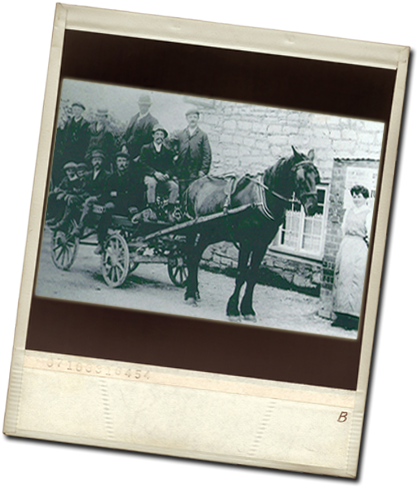 The Said Leopold Cox, originally from Mark, would be remembered with his Horse and Cart. Jacko, the horse in this equasion, would almost know the route better than his ‘master’- often knowing where to stop without being asked! (I guess a modern LOL might be considered) Mr Cox was always connected with farming, remember back in those days, if a neighbouring farmer needed help, it would just happen, generally with no more thanks than that of good will. Queenie, being from a military background as her father, had served in The Battle of Mons on a ship called ‘Queenie’. was active in Village and Methodist Life, being one of the original members of The Good Companions, which still remains going today. A fitting dedication to Queenie took place in 2002, where a Union Jack Flag was dedicated in her memory at The All Saints Church. 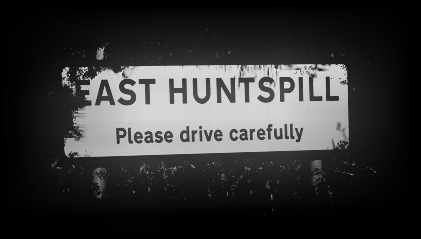 Here we are in 2011, only two Pubs, yet in the late 1950’s East Huntspill supported four- The Crown, The Bason Bridge, The Lamb Inn and The White Hart, the latter two, now private houses. We must mention the British Legion ‘down’ Hackness, sadly in 1994, converted to private housing. We had our own Village Bakery at Nut Tree House - on the corner of New Road by the old Methodist Chapel until in 1960 when it relocated to Mark. The bakers son, Mr Watts still delivers in and around East Huntspill. More ‘easy’ food was available during the 1960’s & 1970’s with ‘Antonios’ fish n chip van, it would park near the Old Chapel on Saturday Lunch times and sometimes on a Wednesday Night. Naturally the customary ‘Red’ phone box has enjoyed its current site for some years on the corner of Hackness Lane, although not to be forgotten, a second Red Phone box is to be found in Cornmoor Crescent that was originally sited at the White Hart Hotel,Withy Road being moved to its current location in 1964, when the hotel closed. Strange to believe that at 7pm on 1st May 1923, ‘Messrs. W H Palmer & Sons’ offered for Auction the premises with Carthouse, known as The White Hart Inn, the then occupant, Mr Oliver Slocombe held a quarterly tenancy and even ‘The District Council Water’ was laid on – one would hope mains water was available or did our District Councillors of times gone by generate income from a 1923 version of mineral water? Lets step to Bason Bridge, well its just the bridge that seperates it from east Huntspill, yet the link of Church Road runs right through. You will of course find The Bason Bridge Inn, our local garage, run by the Cook Family, yet next door to Bason Bridge Garage is a cottage believed to date back to 1800. This cottage from 1918 was the Oil Shop (Modern equivalent of the Household aisle in a supermarket) Mr John (Jack) Haggett from 1918 until he retired in 1952 would deliver said oil with his horse and cart, the shop known simply as ‘Haggett’s’. Mr Horsey took over, renaming the shop ‘Horsey’s’ and with an advert placed in the 1961, East Huntspill County Primary School Spring Magazine, stated that items for sale included Paint, Brushes & Turpentine. Mr Green then took over ‘Horsey’s in the early 1960’s until 1990 when the ‘Oil’ shop was returned to a family home. The mentioned 1961, East Huntspill County Primary School Spring Magazine, was very hand produced, no computers then, yet the planning and care that went into this rare piece of school history is quite remarkable. An article entitled – ‘excitement in the village’ simply detailed that one Jane Clement had fallen head first into the ditch, numerous people had come to her rescue – Mr Alan Wall (who had to have his boots cut off)Mr Rossiter, Mrs Bishop, Douglas & Mr Clement carried her home after almost drowning! The School produced a ‘Do you agree’ village Census for 1961, suggesting that 694 people lived in the village, fifty years later I believe we are around 1100 occupants. 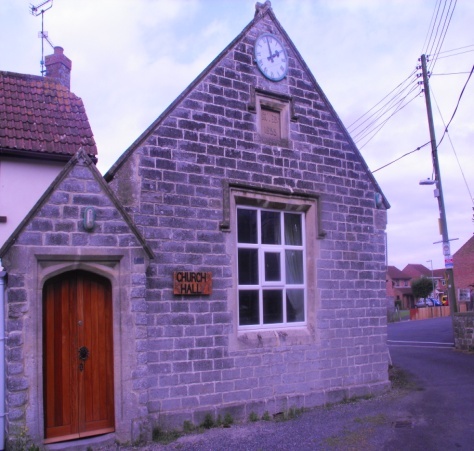 The school in its current location since 1894, originally in the now Church Hall, with the school house, now Church Cottage attached, supported by The Anchorage, named purely as it ‘anchors’ up the school house. Built on ‘Glebe’ land from a decree by the Churchwardens in 1742, that allowed buildings to be built on church land. Donald Stephen Hardcastle - Cornmoor Cottages, John Koster - Withy Farm, Frederick Bowen - lake House Farm, Arthur Whitaker-20 Cornmoor, Janet Dallimore - Hackness Cottage. These Evacuees would probably have arrived on the train, getting off at The Bason Bridge Railway Station. Opened in 1856 by The Somerset Central Railway. A level crossing at Bason Bridge with a goods yard and dairy sidings (The Milk Train) opened by two lever frames at each end of the station. 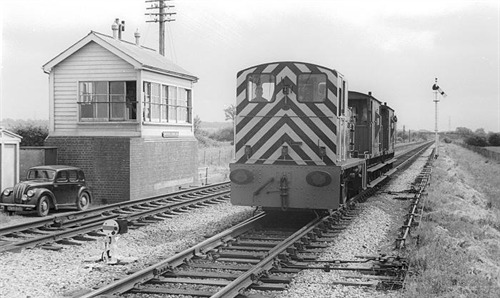 1964 saw the public closure of the station with the dairy spur staying open until 3rd October 1972. The Station House was sold to The Selway family in the late 1960’s. That will do for now, on what I hope will be many more ‘Instalments’ of Village History, thankyou to Myra Cox for showing me only a small part of her History Collection. We now have new future history and welcome the residents of Mercia Close and the soon to be completed ‘Kier’ development, not bad for a village dating back to 796AD.